MASKATEER waist belt is an amazing product that really helps you with weight loss and faster results. This weight lifitng belt should be worn during workouts as it acts like a portable sauna, by making you sweat more removing excess water weight and keeping your core temperature high, which assists in removing toxins from your body and burns fat faster. This slim belt is suitable for all activities including weight lifting, gym, running, jogging, hiking, travelling, and yoga. The MASKATEER weight training belt has 4 flexi steel bones which cushions and compresses your torso area providing amazing back support during weight lifting workouts, reduces the chance of injury, and help to maintain posture. This Ab belt is very comfortable to wear with a double layer of ultra-light net and is made from soft breathable elastic neoprene. 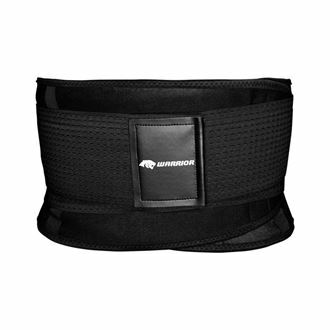 The toning belt does not have any buckles or zips which cause irritation during workouts, but is installed with 2 strong mesh Velcro straps making it easy to put on. This women’s waist belt is perfect for those who are active, regularly exercise but are looking to focus more on their torso area. I am so comfortable in this waist trainer I wear it 6 times a day I don't even go to the gym or exercise and I've seen a difference been wearing it for 3 days now and my waist is already 31 (starting it was 32 target is to get to a 28) I don't work out but I'm really active I just had a c section two months ago and no discomfort. Hi Charlotte. Thank you for the review. We are glad to hear that our Gym Belt is working for you. Fabulous product. My exercise belt arrived yesterday and already I feel it's working. Pleasantly surprise by the quality and support level of this belt. Huge improvement. It really does help to keep your posture right and your tummy tight. I highly recommend it! Hi Claire, thank you for your feedback. Good luck with your target waist size. Let us know how you're getting along. Love wearing my belt to the gym whilst doing workouts. It really makes me sweat more and feels like I’m working on my tummy more. It's also a great back support. Love it and wouldn’t exercise without it. These belts are all the trend at my gym. Comfortable and practical with the structured support. I really like wearing this to in the gym. Makes me sweat more and helps with back support during weight sessions. Strongly recommend. Great to use whilst exercising. I was a 69cm waist and ordered a medium and now I’m 67cm in just a week.